A robotic snake? Oh yes, and it's a pretty clever design too. Each segment has it's own built-in logic, the segments communicate and co-operate to produce the necessary movement. The 'snake' is called 'ACM-R5' and can move on land and in water. Take a look at the article 'Amphibious snake-like robot' on Make: as well as a photo and article there's a fascinating video of this thing swimming. Compass Direct is a news website dedicated to reporting persecution of Christians around the world, it's almost like Amnesty International for believers. In the West we are used to the idea that a person's beliefs are their own business, but in many parts of the world this is simply not the case. In China, Iran, and dozens of other countries worldwide the state prohibits freedom of belief, and in other places individuals and gangs make it their business to persecute believers. A recent example of state repression in Iran shows how shockingly bad it can become. A young couple in Tehran were imprisoned, physically abused, their four-year-old daughter was left alone in the empty house, possessions were confiscated, their livelihood threatened, and worse promised if they didn't return to Islam. Often, all of this is in breach of international treaty committments, UN standards for basic human rights, and sometimes even a country's own national law. Eaton Ford - Hungry? Thirsty? Only brief notes exist from this meeting. We read Job 22 and Matthew 25:34-46. Job was falsely accused of the very same things that Jesus mentions. Isaiah 61:1 seems to be connected too. Jesus came to do good and to bring life to us when we were dead, to bring us bread and wine (his body and blood) to sustain us, to clothe us in purity, to heal us. He expects us to do the same for one another and indeed to meet the needs of the world's needy as well. We are to bring good news, not indifference. The Chinese government accepts the presence of churches - provided they are registered with the government. In practice this means they are controlled and managed centrally and are not fully free to follow the leading of the Spirit. Understandably, many believers meet in groups (large and small) that are not approved by the state. In this way they are free to believe and behave as they feel right. But there is a price for this freedom - persecution. Particularly as the Beijing Olympics approach, the repression has grown harsher and more widespread, yet the hidden churches in China continue to flourish. 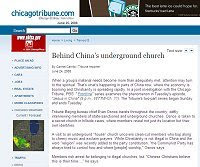 An article in the Chicago Tribune, 'Behind China's Underground Church', describes the situation as noted by an investigative journalist. This example of Jesus dealing individually and personally with an Iranian Muslim is quite extraordinary. 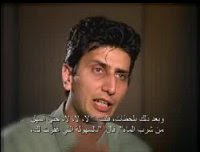 Afshin was in prison, there was nobody to tell him about Jesus, he had no access to a Bible, articles, or books that might explain what it is to be a believer. There was no-one to answer his questions or bring the truth to him. Here, in his own words, he explains how he came to believe. Nothing can prevent Jesus reaching you and changing you, not isolation, or ignorance, or lack of resources. However, like Afshin you need to recognise that nothing you can do for yourself is sufficient, that you cannot save yourself. You cannot lift yourself into the Presence of the Almighty. But he can lift you into his own presence if you are willing to know your need of him!